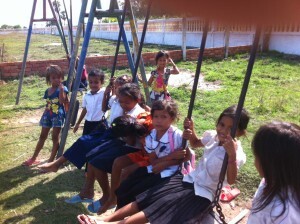 I am John, the coordinator of all our projects in our District of Kamchay Mear in Prey Veng Province, Cambodia. I have returned after 9 months of being ill (Guillian Barre Syndrome) in and out of hospital in Australia. Right now I am 50% well – walking with some difficulty – and am able to do what I have come to do – catch up with everyone and all our projects…. …”our projects’ means everything we do in and around 12 villages to do with our three schools and attempts at health care and improving where we – can village life. “our” means, The Rotary Club of Beaudesert, Rotary everywhere, and friends and family everywhere. Particularly it means YOU and ME. It means Surrey in England and the South of France – particularly Avignon and the Cote d’Azur, it means New York…. basically it means YOU. They are our children – our families. Medicin Sans Fronters (doctors without borders) will not come to us ” you are too remote”… Similarly visiting US military Doctors wont visit us…. 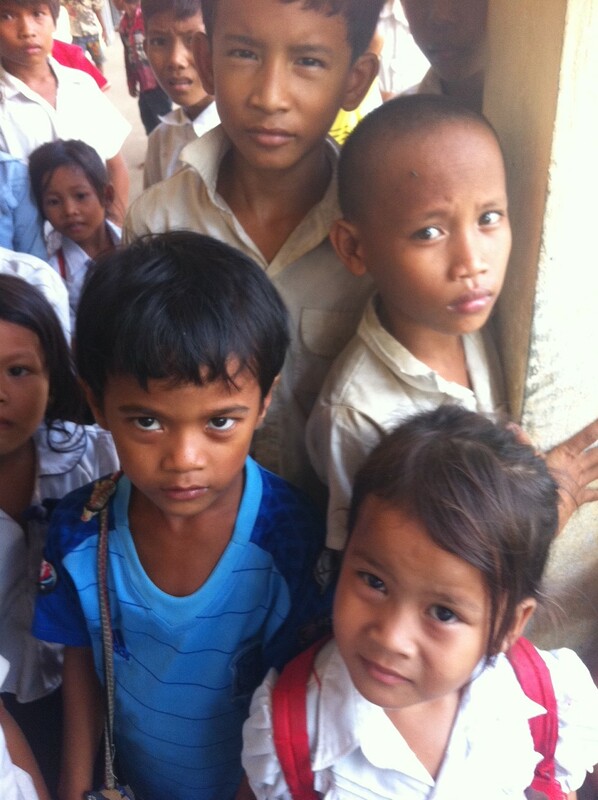 We are asked to take patients to Phnom Penh (the city)… THE problem is ‘who is a patient’? .. obviously an accident is a ‘patient’ but are we then expected to drive them on the back of a motorbike through rice fields and three hours of road?!…….. which leads me TO THE AMBULANCE…. 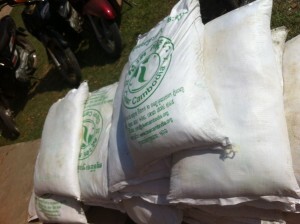 As you might know (see several recent posts) two years ago the Kamchay Mear District said if we could donate a District Ambulance (there isn’t an ambulance in the District yet) then the District would (will) find us – visiting Doctors….. we have had for 9 months our Ambulance (packed with donated goods) sitting on the dockside in a container in Phnom Penh… The ambulance is a major bureaucratic nightmare for the government for many almost unbelievable reasons… I will attend a meeting about THE AMBULANCE with Cambodia Customs on the 22nd – four more days, I am hopeful but history tells me that this wont be the end of the matter. Today I will show you the first 33 photos that I’ve taken since arriving in the villages on June 10. the photos will have explanations below or alongside them. If you look at the banner heading of this website you see a row of children. Micara is second from the left. 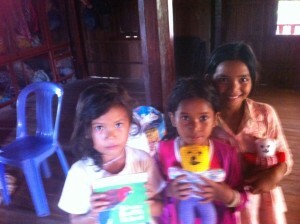 The three friends as we called them were in Micara’s case 5 years old.. 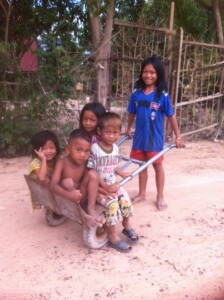 In todays photo, pushing the trolley, Micara is 12 years old… under nourished but happy. 100% of the rural population has tapeworms. The effect on small children is worse than for adults. We worm the frailest children but it needs repetition. Of course the solution should be ‘no parasites’ but that is easily said and almost impossible to achieve at this stage. MAJOR GROWTH at the Chuor Ph’av Schools. 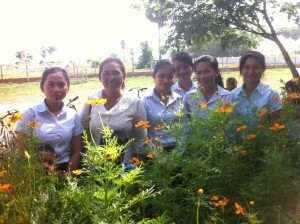 In this photo you see the six female teachers at this school ( later you will see the two male teachers too). 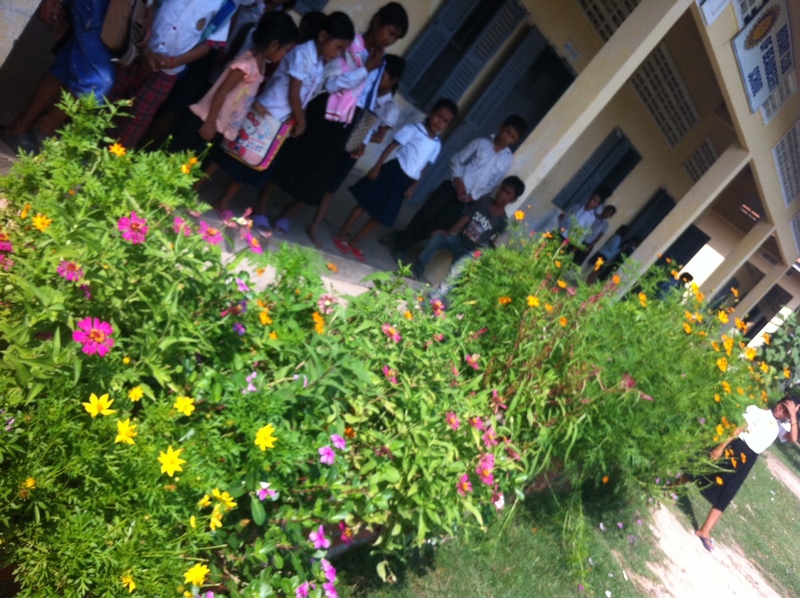 Sok Ken’s (head teacher second from the left) flower gardens are very successful and extremely popular with everyone.. You will see more of the gardens as you scroll). A School several kilometres away from us through rice fields has had to close down through a charity pulling out prematurely and the Government unable to support it financially – SO – we now have ALL THEIR CHILDREN and by January we will need another three teachers.. We have well over 1000 – until I count, I’m guessing at 1,300. Remember, our classes are twice a day at 100 children per class. I am with the eight Chuor Ph’av teachers – The Head Teacher, Sok Ken is to my right. The two men are on my left. 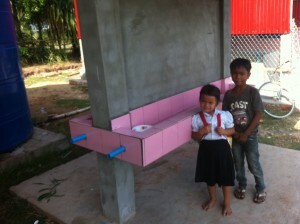 Next, I’ll give you several photos associated with a DONATION from an NGO named “CLEAR WATER CAMBODIA”. 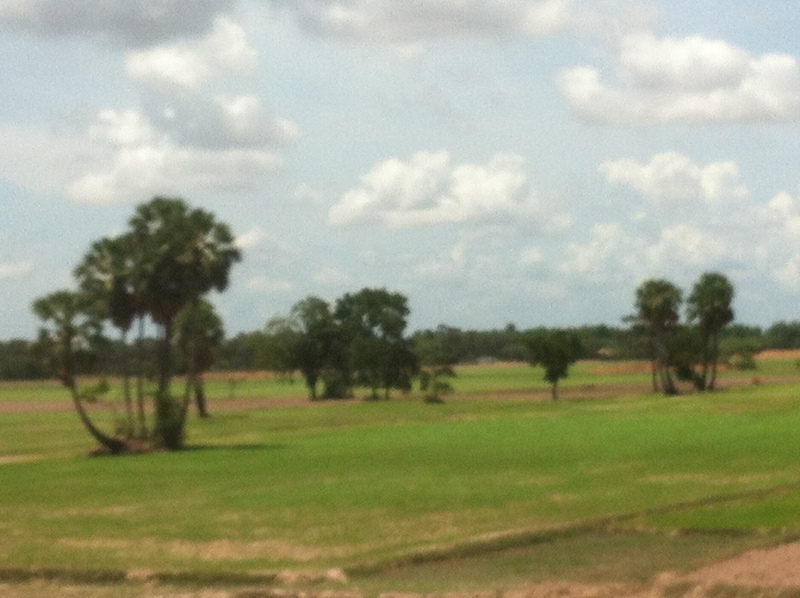 For almost five months of every year there is no rain; there is still plenty of ground water but no rain water. 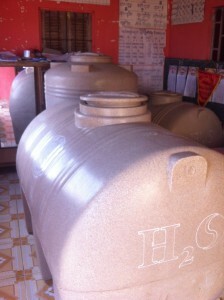 We collect rain water and it is stored in the blue tanks, but it soon runs out. A Charity named “Clear Water Cambodia” contacted us and this is their work in progress. 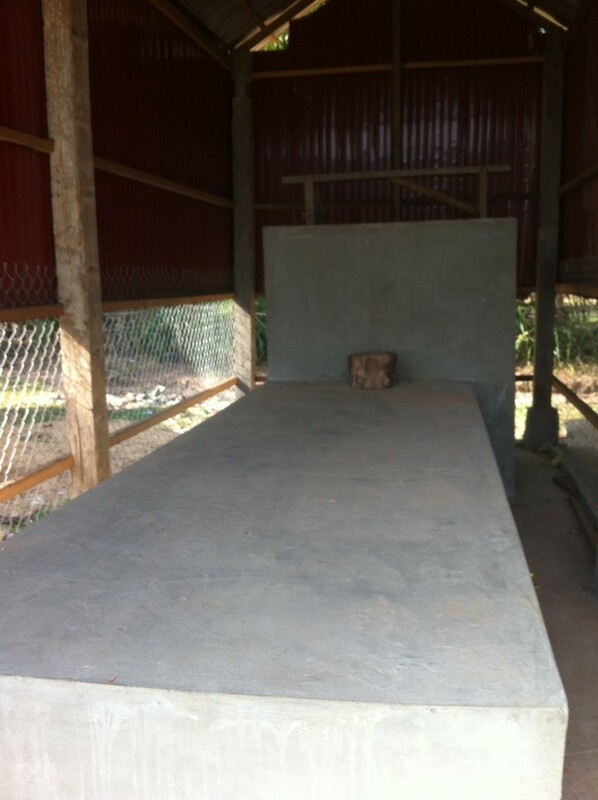 In a shed on an elevated and a lower slab there will be four tanks holding pumped ground water. The ground water is filtered to high quality drinking standard (bags of filtering material in a photo).. For the foreseeable future the charity commits itself to support its school – and in this case that is us!! 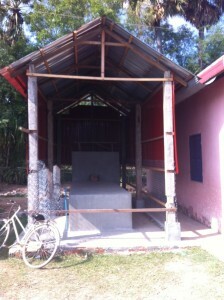 They have so far built the shed and the drinking trough. It looks like WE will have to fix our solar system to pump water from our wells to the tanks.. That will cost us two new solar batteries, labour and wiring. (To anyone who thinks that this is not sustainable I might remind you that every town and city in the world – filters, cleans and pumps its water). This photo shows 4 things..1. Sok Ken’s flower beds. 2. 100 bicycles. 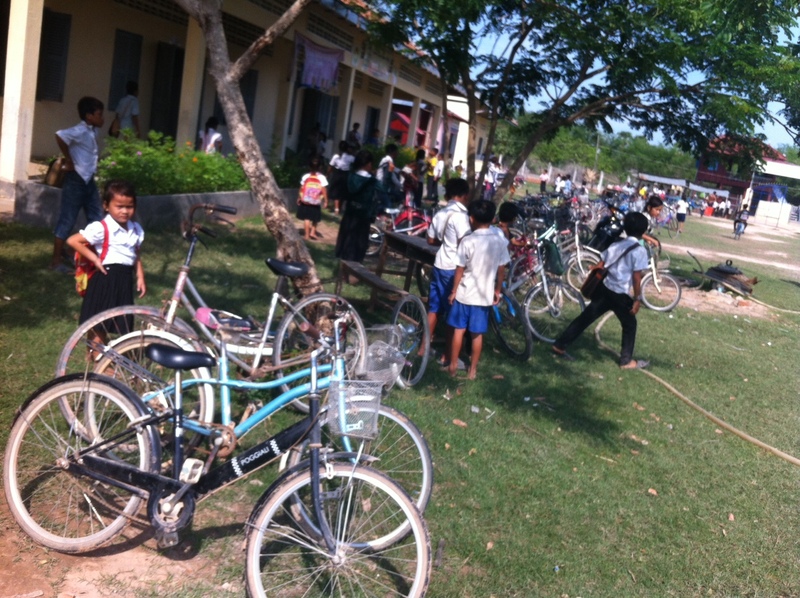 When we started there was ONE bicycle.. Over time a family bicycle has become a priority – although our families can afford very little ( in many cases we give clothes) they all agree that their childrens’ education comes after food in the order of things.. so to get to school – a bicycle. …. …. and 3. a row of buildings. 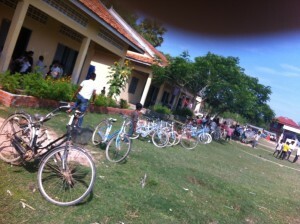 The very last one at the end of the bicycle row is the ”teachers house’ built specially for teachers who need a place to live. Over the years it has been used for accommodation once. Mostly it is teachers meeting, special classes and storeage… ……. …… but the proposal is that with some interior demolition the ‘teachers house’ becomes A PRE SCHOOL . School for 3 to 5 year olds as in the west. This is why earlier I mention ‘at least’ fourteen teachers. 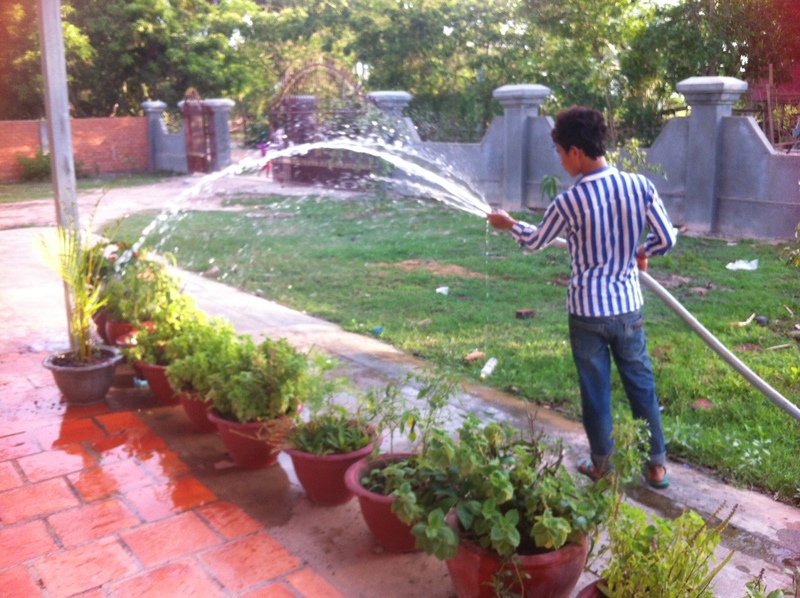 I have said an enthusiastic tentative yes – after all – SCHOOL is our core business!! and the 4th thing you can see in this photo – is my thumb over the lens – sorry. 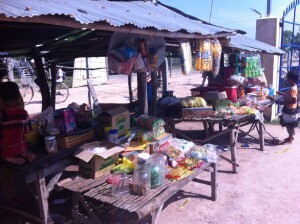 Sok Ken has has asked for financial help to build more gardens. There will still be plenty of room for sport. 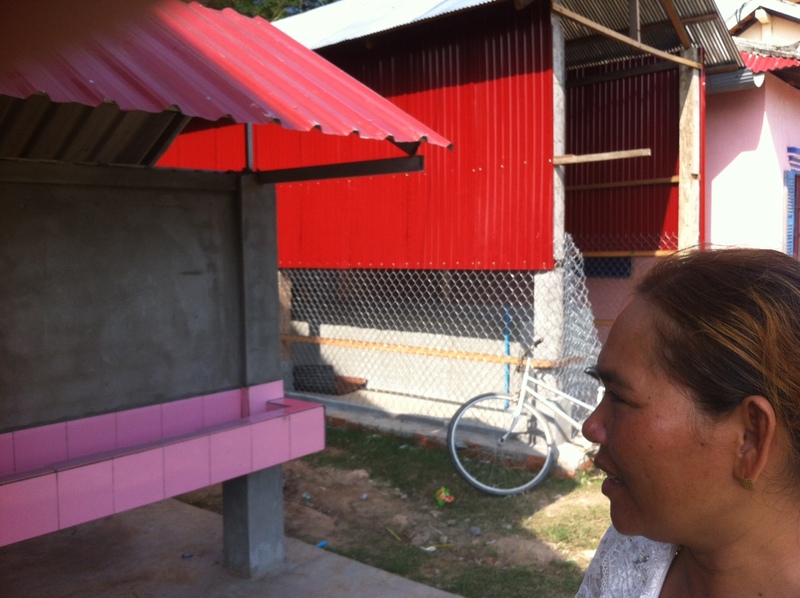 She, with children and teachers support has done VERY well. 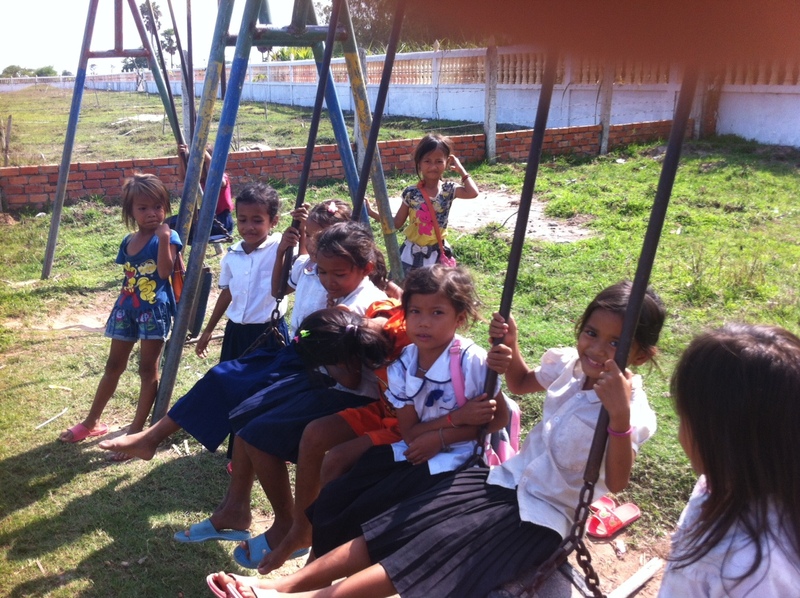 The swings donated by UNICEF are still very well used ….. and, did you spot Nang’s daughter in the middle? The last building visible in the row of buildings is the building that might become a Pre School. 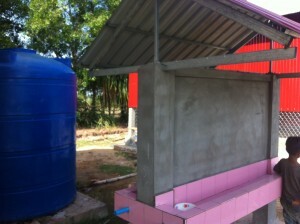 The tuckshop next to the gate. Four of our brilliant teachers quietly sitting. Remember their classes for each teacher are 100 children in the morning shift and then 100 completely different children in the afternoon shift. a meeting with Chanthou in our red clinic. Downstairs at the Guesthouse. I’m sorry its a poor quality photo but as a document it is important. 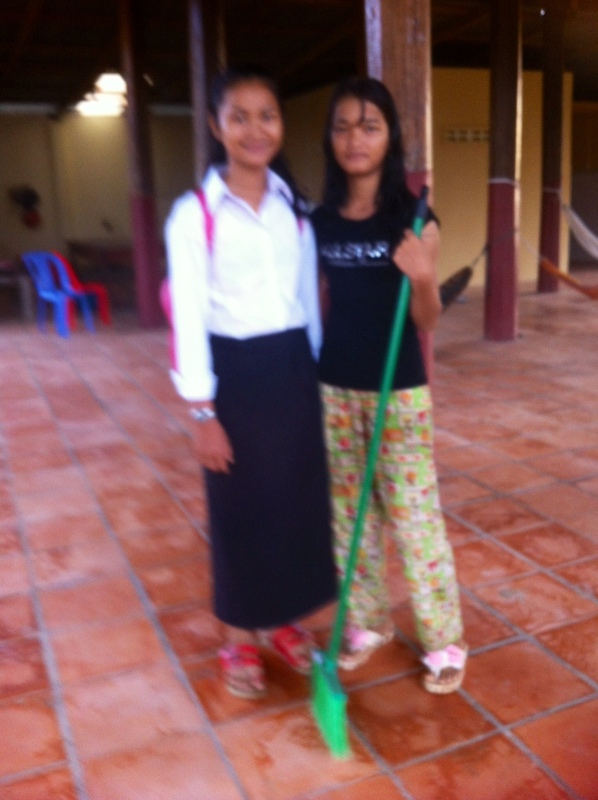 Chanthou’s daughter Soklep left school with no real academic interest and so now happily works at our Guesthouse…… MEANWHILE, Soit (SOKLY is her real name). became too old for our school and so now very willingly cycles several kilometres to High School every morning. 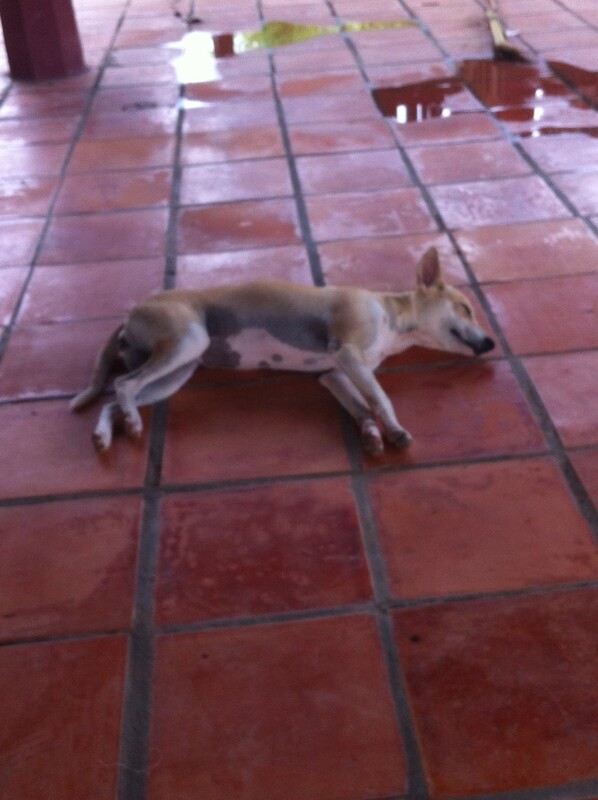 SOIT is the girl we rescued from an island factory near Koh Kong in the far south west… we still have plans for Soit but its all a bit slow. I have had 8 days to get used to my new dog and why I have a new dog. This is Spot, wisely named Spot before my arrival. “Where’s Kelly”? I asked. There are earlier posts with Kelly, my wonderful dog. Beaudesert Rotary Club visitors loved Kelly too. Kelly was loveable. 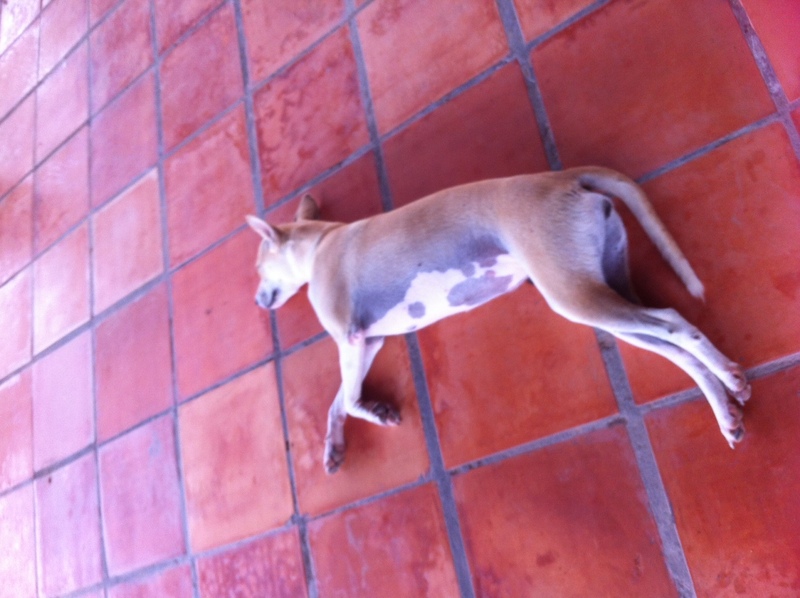 “John, I’m sorry but the neighbours took her and ate her.” I have only ever owned three dogs in all my life….. Kelly and Kelly’s Grandfather (who was magnificent were both eaten in my absence… and now Spot………………. Good luck Spot…. Spot seems to be lovely dog too. Incidentally all dogs in Cambodia are “Asian Dogs”… The Australian Dingo is an Asian Dog that probably migrated somehow to Australia a 1000 years or so ago. This is Nang’s mother (see Nang’s story to the index left of this screen) Today’s second photo of Micara (she is today’s first photo. Then there is Nang’s daughter Peery. 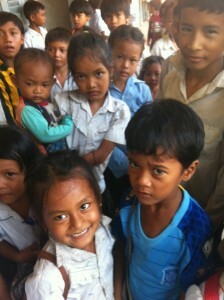 Mab is Nang’s younger sister and she got married last year and is now six months pregnant. I promised Nang that we would take care of Peery and we do. Theres a great many Guesthouse photos in earlier posts. This was todays view from the back steps. just to the right of centre and one kilometre away is The School. Please contact me if you want to visit and volunteer. 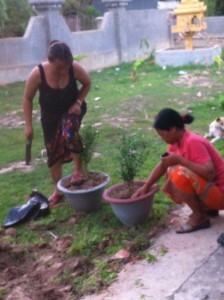 Chanthou and her sister, Eeya gardening. I take thousands of photos and indeed there are several thousand photos on THIS website.. Please browse and then find the Donate page (plus a Donors page and what your money can buy information. This is enough for today. The last photo today is of Peery, Sot and Maigin. 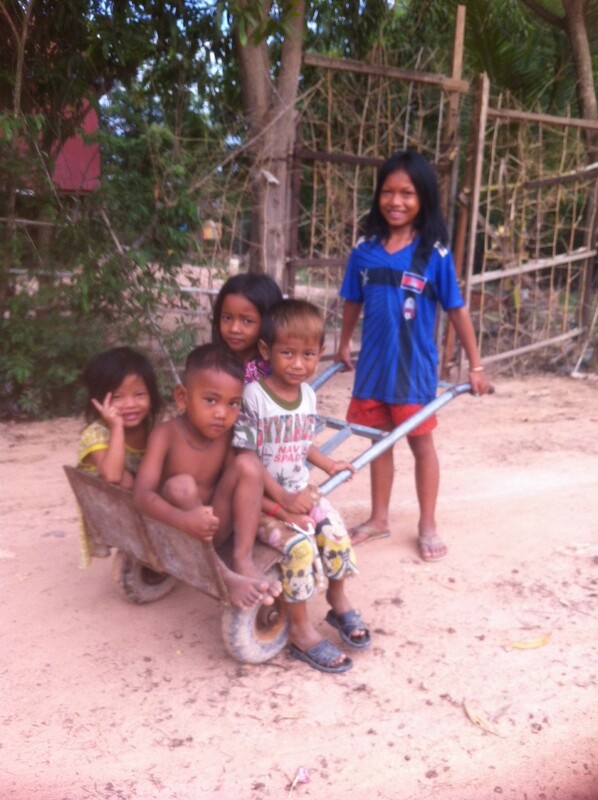 Everyone… EVERYONE who visits our villages brings about 1o kgs of clothes or presents. This time I brought 2o kgs of stuffed toys and books. Peery and Sot and Maigin are saying a heartfelt THANK YOU VERY MUCH (Arkun Cherern). 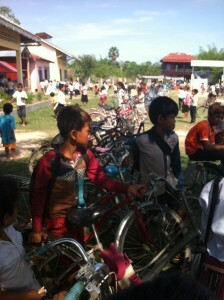 I’ll write again soon – John at The Schools.